A couple of years ago at a church potluck, I saw a bowl filled with green beans and onions. Normally, I would have ignored the dish -- I don't like beans with onions -- but the beans smelled delicious so I put a small serving on my plate. After one bite, two things were apparent. One, the beans were flavored with something besides onion. Two, I wanted the recipe! As the potluck wound down, I watched as people collected their bowls and pans from the food table. When I saw Aaron, owner of the now empty bowl, pick it up off the table, I walked over and asked how he made the beans. He graciously shared the recipe and I made the beans for the first time a few weeks later for Thanksgiving. The recipe starts with a can of cut green beans. The liquid is drained into a saucepan with some water, chopped onion and -- the ingredient that makes the beans so good -- adobo all purpose seasoning. I wasn't familiar with adobo so I looked it up on the Internet. My search yielded a lot of recipes for making the seasoning using salt, paprika, black pepper, onion powder, oregano, cumin, garlic powder and chili powder, or some combination of these ingredients. I didn't mess with perfection and bought a bottle of Goya adobo all-purpose seasoning with pepper which is what was called for in Aaron's recipe. 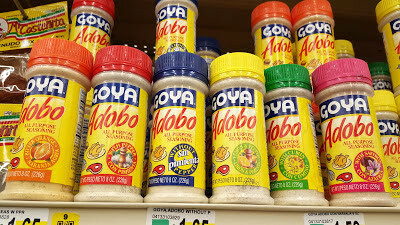 I assumed the seasoning would be with all the other spices, but I found it in the aisle with Hispanic food. The Goya brand is available in many different varieties! The liquid, onion and adobo are brought to a rolling boil for 30 minutes. During this long boiling time, the liquid is reduced, thereby intensifying the flavor of the remaining liquid. After boiling for 30 minutes. The beans are added to the pot and simmered over low heat for 15 minutes. You can add water, if necessary, but don't add too much or it will dilute the wonderful flavor of the beans. The beans can be served the same day they're cooked, but I think they're better reheated the next day after the flavors have had time to blend. You can reheat the beans on the stove, or in a crock-pot. Using a crock-pot is a big help at the holidays, especially if there's not a spare burner available on the stove. You also don't have to keep a constant eye on the beans since the crock-pot does all the work for you. Green beans have always been on our Thanksgiving table, but now I fix them ahead of time. When I'm cooking holiday meals, any dish that can be made ahead is something I'm thankful for! Drain liquid from beans into a saucepan; add onion, adobo and water. Bring ingredients to a boil and let boil for 30 minutes. If the liquid is reducing too quickly, turn the heat down. Add the green beans and, if necessary, a little additional water. Turn heat to low and simmer 15 minutes. Let the beans cool and then store them in a covered container in the refrigerator overnight to allow the flavors to blend. The next day, reheat beans in a crock-pot on low for 2 hours, or until heated through.